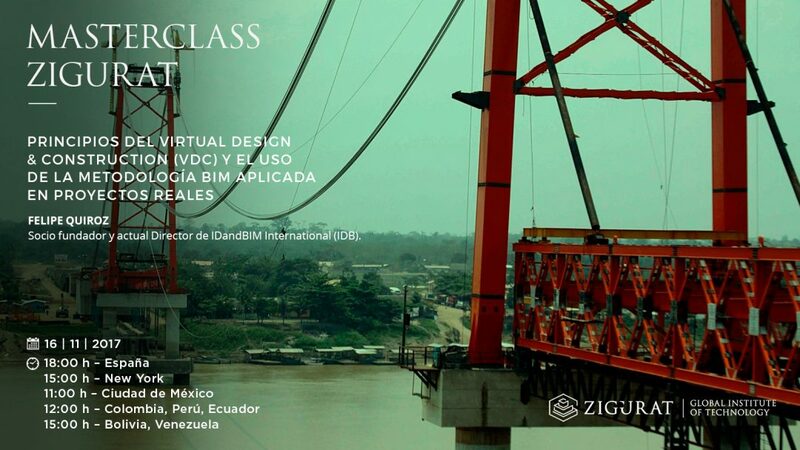 Principios del Virtual Design & constrction (VDC) y el uso de la metodología BIM aplicada en proyectos reales..
Principles of Virtual Design & Construction (VDC) and the use of the BIM methodology applied in real projects. El próximo martes, 16 de Noviembre a las 18:00h (hora española), Zigurat Global Institute of Technology realizará una masterclass de Procesos Constructivos Desarrollados bajo Metodología BIM y LEAN. La sesión estará presentada por Felipe Quiroz, Socio fundador y actual Director de IDandBIM International (IDB). Are you going to the event? Log in and join us! Building Information Modelling - April Networking & Property Talk Event. China Int’l Integrated Housing Industry & Building Industrialization Expo--CIHIE 2019. In its fifth edition, the international congress will address the experience of BIM in Scandinavia. Do not have an account yet? Join the community now, it's free! Complete the data to finish the creation of your account! Thank you for subscribing to the Newsletter!